We are always looking for a deal and ways to save money. 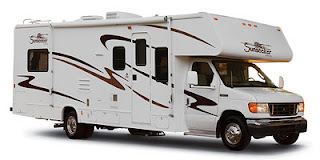 'Cause we want to do more agility, get that 5 acres of land we've been wanting, maybe rent a recreational vehicle (like this one) to get to Scottsdale for the Nationals, finally get a dogwalk and aframe. So when we have to buy 'stuff' we always look for coupons, ways to save on shipping, special deals. Sometimes we even find it's less expensive to shop on the Internet than to drive with gas prices the way they are now. Yikes! We found this shopping discount site, and we got kind of excited. It's like finding all the coupons, sales, special deals, free shipping and more, all in one place. Hopefully it will save us time and keep us from searching all over the Internet looking for free shipping or $$ off, because a lot of our favorite stores are listed on their site.